You are in pain and want information about our Triton DTS Spinal Decompression treatment. You've come to the right place. Here you can order Dr. Karl R.O.S. Johnson, DC's information packet with his DVD, highly informative report and color brochure. DTS Spinal Decompresssion Therapy is a pain-free alternative that has shown a very high rate of success at reducing and even eliminating back and neck pain altogether! According to a study in the American Journal of Pain Management, Spinal Decompression provided good to excellent results for 86% of patients with herniated or ruptured discs and 75% of patients with facet arthrosis. Just fill in your contact information below and we will deliver to you our informative and helpful education packe. You owe it to yourself to do your homework so you get the best chance for recovery. 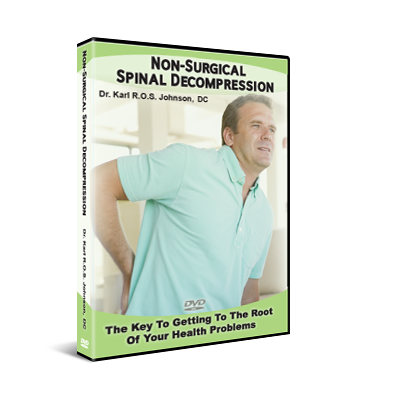 Non-Surgical Spinal Decompression has been successful even with the most severe cases…when NOTHING else has worked, even after failed surgery.